An estimated 6% of the total area of New South Wales lies within roadsides. Of this area, approximately 2.5 million hectares are owned and/or managed by councils. The natural assets that make up these roadsides possess a number of environmental, community and heritage values. Councils are required to consider a multitude of complex factors when managing roadsides, such as, road safety, biodiversity values, cultural values, heritage values, firewood collection, bushfire management, aesthetic and recreational values, routine maintenance activities, legal requirements and development pressures. Conservation of these areas must aim to balance functionality and values. Councils generally value the built environment in their jurisdiction yet the adjoining roadsides can be undervalued or overlooked. The Council Roadside Reserves (CRR) project, funded by NSW Environmental Trust and managed by Local Government NSW (LGNSW), aims to build the capacity of councils to embed the value of roadsides into their Integrated Planning and Reporting systems. 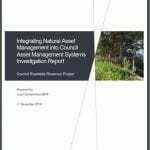 Stage 1 of this State-wide initiative investigated current activities undertaken by councils in managing natural assets in the broader asset management context. A key recommendation from this work is to identify roadside asset types and develop asset management objectives for integration into the Strategic Asset Management Plans of Councils. The need for this is reinforced by the direct experiences of Councils across the Hunter and Central Coast region who have been delivering a range of roadside environmental management initiatives over many years, including the Regional Roadside Environment Marker Scheme. This regional workshop represents the first step in directly assisting Councils undertake this task. 3 Natural assets – what are they? How are they different?